Systems such as these are responsible for the maintenance of process streams of variable chemical composition and monitor liquid flows including oil, water, coolant, fuel, syrup, slurries, acids, bases and corrosives. Metering pumps are essentially at the core of these systems as they enable manufacturers to cyclically introduce a consistent amount of fluid into a continuous-flow stream to ensure homogeneity. Metering Systems – Primary Fluid Systems Inc.
Industries such as chemical processing, pharmaceutical, food and beverage processing, water treatment, medical, commercial vending, irrigation, petroleum, milling, sewage, plastic fabrication, metalworking, automotive and analytics among others commonly utilize large and small metering pumps in daily operations. 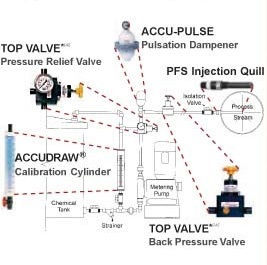 These systems rely on the ability to adjust flow rates as needed throughout processing. This can be done either through the alteration of stroke length or changing the frequency of pump cycles. Pumps employing the latter model would be fixed displacement variable speed metering systems while the former is known as a variable displacement constant speed system. Adjusting cycle frequency is often easier and therefore more popular in industrial and commercial settings though both types of metering allow for an unending continuous flow of metered fluid into an expulsion unit, be it a dialysis machine or beverage dispensing unit. Further considerations for metering systems include material construct which is highly variable, maximum flow, maximum pressure discharge, inlet size, exhaust size, media, operating temperature and power source. There are four common types of metering systems. Diaphragm metering pumps use a vibrating membrane to move fluids from one point to another while bellows pumps employ pleated or accordion style welded rings to compress and decompress fluids. Piston metering pumps use a cylindrical rod to increase or decrease pressure in order to engage fluids and effectively expel them in precise amounts and accurate flow rates. Peristaltic pumps are the most variable as they use rollers which run along tubes in order to meter liquid. Despite the differences, most units within a metering system have similar features. A pump head, or cylindrical cavity is the central component which houses not only the actuating device, but also an inlet and outlet check valve through which liquids flow. Additional components may include a fluid reservoir as well as tubing or hoses which carry the fluid from one point to another as directed by the pump. With all the proper parts aligned, each metering system operates in a two part process. The first action is suction, or the intake stroke. The actuating device, be it a piston, bellows, membrane or rollers is withdrawn in order to increase the capacity of the pump head. This creates a vacuum effect which draws fluid in through the inlet valve. At capacity the valve closes. The actuator is then extended towards the liquid at a specified speed, creating pressure which forces open the outlet valve. The liquid is expelled due to the displacement. This process is repeated as many times as needed and may even run continuously in some systems. Metering Systems Metering systems include all apparatus implicated in the precision transfer of carefully measured fluids through positive displacement.